OMEGA Engineering offers a wide range of wireless products in Singapore. Controllers function similar to a receiver in the sense that they receive and analyze data from wireless transmitters. 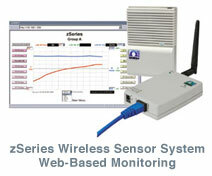 However, the wireless controllers are also able to manipulate a process based on the data being measured. For example, if a furnace becomes too hot, a controller can recognize the increased temperature and send a signal to turn off some heating elements. Data Loggers form a special type of wireless measurement network because they give a new dimension of flexibility to the end user. Wireless data loggers can remotely monitor temperature anywhere and then transmit the data back to an engineer once the unit is brought to a receiver. These miniature wireless sensors are useful for applications that involve a roaming element, such as food being shipped. By packaging a wireless data logger within a shipping container, a vendor or transporter can ensure and certify that products were refrigerated all the way to a distributor or grocery store.